SYRACUSE, N.Y. - Laboratories in quiet corners of the SUNY College of Environmental Science and Forestry (ESF) could reveal the secret to revitalizing what was once a major component of the nation's eastern forests: the American chestnut tree. Two ESF professors, a research associate, and a small group of graduate students are in the painstaking process of genetically engineering an American chestnut that is resistant to the invasive blight that nearly wiped out the species 50 years ago. William A. Powell, Charles A. Maynard, and Zizhou Xing. This fall, the work is being undertaken with renewed energy. The current New York state budget provides $150,000 to fund the American Chestnut Program at the college. It is anticipated that this appropriation is the first installment of a three-year research effort totalling $450,000. Western New York constituents who shared a concern for the disappearance of the historically prominent hardwood tree. "We were teetering on the brink of bankruptcy. We were literally down to the point where we had a couple hundred dollars left. So the state grant saved the project," said Dr. Charles A. Maynard, a specialist in forest genetics and tissue culture who is a professor in ESF's Faculty of Forestry. "Through the genetic breeding of fungus-resistant American chestnut trees, we will be able to gain valuable insight in order to save other essential and valuable trees, such as the state maple tree," Rath said. "This underscores my belief we must maintain our commitment to the environment of New York." One aspect of the research is the province of Dr. William A. Powell, a molecular biologist in ESF's Faculty of Environmental and Forest Biology. He is searching for genes that will make American chestnuts resistant to the fungus that kills them. One possibility, he said, is transferring a natural defense gene from another plant into chestnut trees. He is working with a gene that helps wheat seedlings protect themselves from fungi found in the soil. The gene neutralizes the acid produced by the fungi and as a byproduct produces hydrogen peroxide, which stimulates the seedling's natural defense mechanisms. Or the answer might be in frog skin. Researchers have discovered that frogs have a gene for an anti-microbial peptide that prevents the damp skin of frogs from being covered with fungi and bacteria. Anti-microbial peptides are a class of short proteins that are found in a wide range of organisms, including frogs, moths, and human beings. Powell redesigned the frog gene in the laboratory to make it effective against the blight pathogen. The third focus of Powell's attention is a gene that enables certain fungi to digest other types of fungi. This fall, assisted by graduate students, Powell will focus on assessing which of the three genes is the best choice for the chestnut project. He will also work on attaching the DNA sequence that acts as a promoter, allowing the gene to be effective in the trunk and stems of the tree, the only part of the chestnut affected by the blight. While Powell is working on genes, Maynard and Dr. Zizhuo Xing, a research associate, are across the ESF quad in Marshall Hall, perfecting techniques for transferring genes into plant embryos. 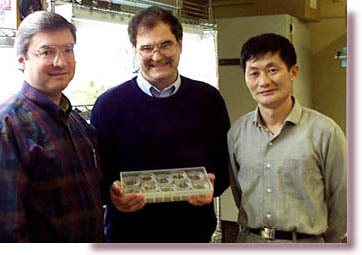 The members of Maynard's research team remove the developing embryos from a chestnut. Normally, one of those embryos would mature into a seedling. But, using a process called somatic embryogenesis, the scientists can back up the chestnut's cycle a few steps so it continues to produce more embryos. The process was developed in Georgia and modified by Xing, who works in ESF's Faculty of Forestry. After the embryos multiply, the researchers perform the gene transfer, bombarding the embryos with the blight-resistant genes with which Powell has been working. Then they determine which embryos carry the gene. When the developing embryos are large and strong enough, they are transferred into a potting solution and nurtured in a growth chamber where the light, heat, humidity, and temperature are controlled. Powell tests the young plants to determine if they indeed have the blight-resistant gene, and those that do are moved outdoors to the college's LaFayette Experiment Station so their growth can be monitored. It is a tedious, time-consuming process. "We've got to get better at it before we can talk legitimately about cranking out thousands of trees that people can plant in their yards," Maynard said. The American chestnut is a member of the oak family. It tends to grow straight, making it suitable for use as telephone poles and railroad ties. Pioneers used chestnut logs for the foundations of their cabins and homeowners would likely use it for backyard decks if it were available today. "The heartwood of the species is amazingly rot-resistant," Maynard said. "It is the natural equivalent of pressure-treated lumber." In addition to the practical aspects of having American chestnuts towering in the forest, Maynard said, there is some old-fashioned nostalgia attached to the stately trees. "Everybody's grandpa passes down stories about gathering chestnuts and throwing them back and forth at each other across the creek, and turning out the hogs into the woods to fatten up for the winter," Maynard said. "It's part of the whole cultural, nostalgic thing." The blight was first identified at the Bronx Zoo in 1904. By 1950, few American chestnut trees survived. "In New York, we have the distinction of being the first place where it started," Powell said. "It would be really nice to be the place where it ends."